Hi All. Been baking lots lately. Won’t be putting any recipes up for now as Christmas is around the corner and I’m not trying anything new. Just old classics. We had LT’s birthday on the weekend, thought I’d share our spread of sandwiches. We always go over the top. 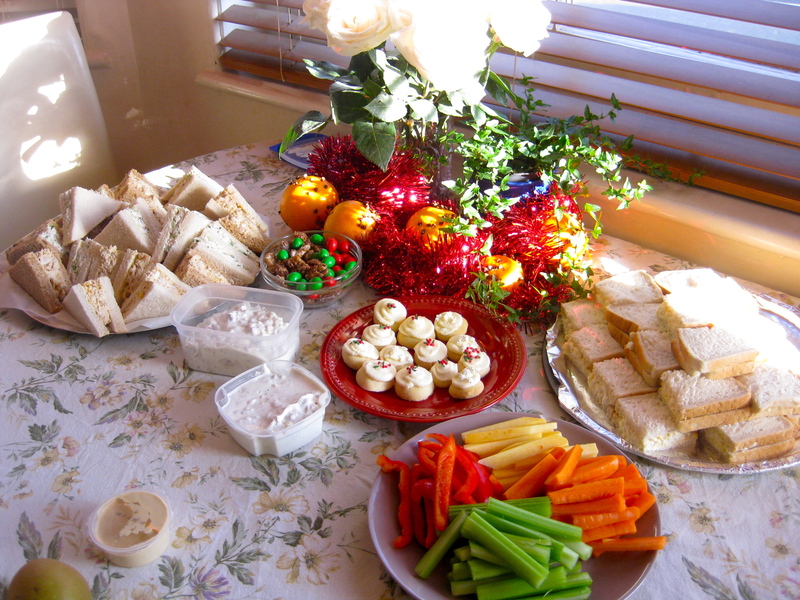 But you can see our home-made pomanders on the table and the colourful crudites. Watch this space for our annual Christmas Cheese night. I’ve got loads of cheese this year. A Lancashire bomb, of this lovely creamy cheese with a cheddar flavour containing apple and port. I’ve also managed to score some Castello cheeses for the night from a Foodepedia piece we ran. And I bought a curious wedge of fruit cheese from Waitrose. We’ll have to see about that one.